.locaux annexes available on request for bicycles or others. Owners on site for all possible assistance ..
all convenience city ST Michel de Maurienne accessible on foot. 2 separate bathrooms and 2 toilets. independent. Myself and three friends stayed here for a one week cycling trip in September, and it was just what we needed. Plenty space, all of the amenities that we needed, including space to store and work on our bikes. It's located in easy reach of a number of the big and famous Alpine climbs, and a short drive to some of the others (Alpe d'Huez, for example). Daniel and his wife were perfect hosts, very friendly and welcoming. If we were to visit the area again then we would try and book this property. Trois amis et moi-même avons séjourné dans cet hôtel pour une semaine à vélo en septembre et c'était exactement ce dont nous avions besoin. Beaucoup d'espace, toutes les commodités dont nous avions besoin, y compris un espace pour stocker et travailler sur nos vélos. Il est situé à proximité d'un certain nombre de grandes et célèbres ascensions alpines, et à quelques minutes de route de certaines des autres (Alpe d'Huez, par exemple). Daniel et sa femme étaient des hôtes parfaits, très sympathiques et accueillants. Si nous devions visiter la région à nouveau, nous essayerions de réserver cette propriété. Comfy big house to relax in the Alps. We spent a week in Saint Michel de Maurienne and the surrounding areas and stayed at Daniel and Monique's house. The house is supposed to be for 11 people, although a full house would have been a bit too tight. Since it was only for four of us, we had plenty of space to enjoy and relax. The kitchen was fully equipped (quite rare among houses for holiday rental) so we were able to cook every night. This was a plus because most restaurants were closed for the holiday season (August). Daniel and Monique were super nice and welcoming. I don't speak French but we managed to understand one another. This house is perfect for keen cyclists and hikers. I totally recommend it. We had a great holiday based in this spacious and well equipped property. The house is perfectly located for cycling many of the famous Alpine cols. The accommodation has lots of space, garden and terrace for barbecues, own garage for the bikes and has a central yet quiet location. Daniel Thevenon, the owner lives next doors and he was always on hand to offer friendly advice and local knowledge. Highly recommend this property and would definitely use again. 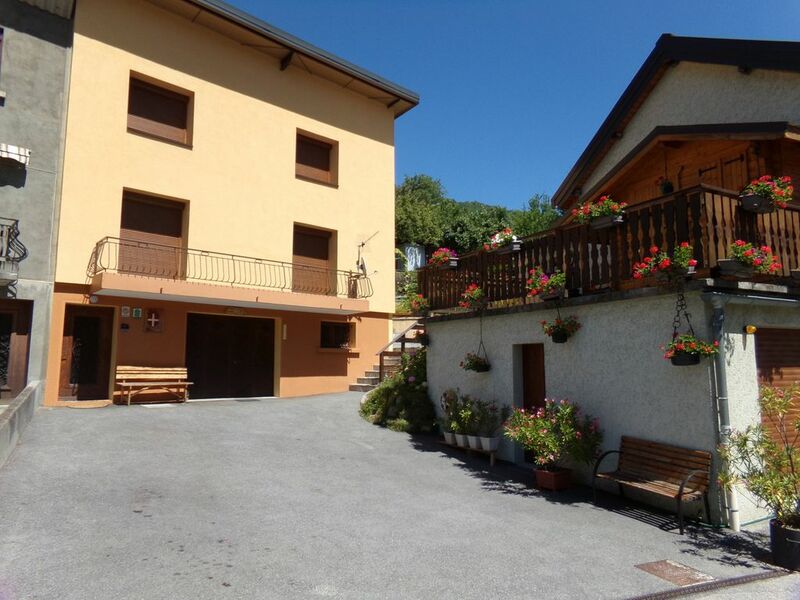 Great, spacious house, very well equipped, and very well located for cyclists. Comfortable and clean. Bike store. Very nice, welcoming and helpful owner, M. Thevenon. Good value. Good views from widows. Highly recommended. A very nice stay. Belle maison avec beaucoup d'espace, très bien équipée, et très bien localisée pour des cyclistes. Confortable et propre. Local a vélos. Très gentil, bienveillant propriétaire qui est disponible pour vous, M. Thevenon. Un bon prix. Jolies points de vues depuis les fenêtres. A saisir. Un très agréable séjour. The house was perfect for our four person biking holiday with lots of space, own privacy, own garage for the bikes and central yet quiet location. The owner living next doors has a great attitude and he was always ready to help us with any issue we might face. If French is not your strength, don't worry. None of us speaks French but we could easily communicate with the owner, it's all about attitude. I can fully recommend Daniel's accommodation, but don't fully book it, since we are coming back! During the first week of August 2013 we stayed in this house with a group of 8 people; 2 women and 6 men (two families and Pino). The reason for us going to the Maurienne were the exquisite circumstances for cycling, while the women would take their change to climb mountains by foot. For cyclists this location is perfect, both during the day (steep mountain roads to ride) as during the evenings when one needs to recover from riding or walking through the mountains. The house is connected to the one of the neighbors but that does not cause any problem. Probably walls are that thick that no sound can pass through it. The house has 4 large sleeping rooms and can occupy 10 to 12 (or more) people. Two nice bathroom are situated on the first and second floor. So it was very spacious for our group. The kitchen is very well equipped and there is a balcony and small terrace to enjoy the sun after climbing the mountain tops. To complete the scene a garden is provided on the hill side next to the house. We could use the large garage for storing our bikes and transportation equipment. I can’t remember there was a negative thing about this location. Only 300 m from the 'city centre' of St. Michel with all necessary shops and a supermarket. Also the owner was pleasant to deal with (French only). We all loved staying there and had a fantastic week. depuis votre séjour nous avons installé un HOTSPOT WIFI pour le gite, créant une connexion fiable. nous arrivons toujours à établir le contact. Bienvenue à nos amis cyclistes. Valloire / Valmeinier: 12 km. envois des documents à réception d'un acompte de 30% , règlement du solde à l'entrée dans les lieux ;Avec le chèque de caution et présentation attestation assurance de villégiature. Pas de suppléments eau, gaz, électricité.draps fournis. facturation de 80€ de ménage si celui-ci non fait les options seront incluses dans le prix général Les pannes sur électro-ménager durant le séjour seront traitées en fonction des disponibilités,sans garantie de délais. Arrivée à partir de16h, départ avant 10h.